Last October we were on our way home from the Albuquere Balloon Fiesta in our 2013 Adventurer when some brush fell of a truck in front of us. Being unlucky a 3" diameter branch skidded down the highway and managed to hit the right front cargo bay door. It isn't significant damage but I would like to remove the door and take it to the body shop for repair. 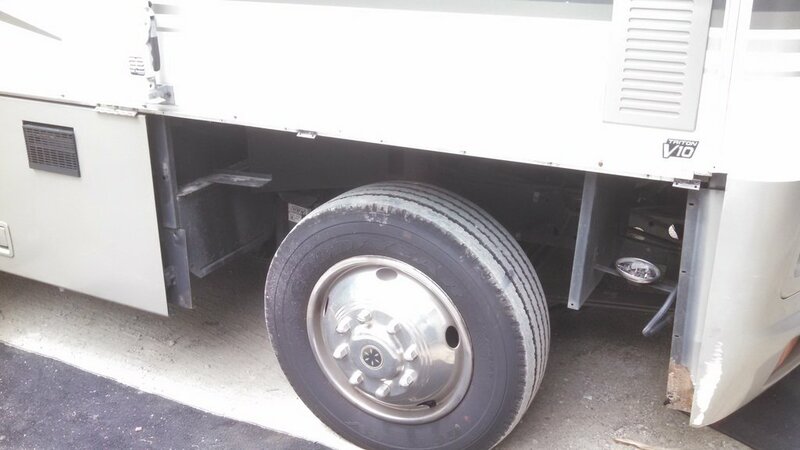 When I called Winnebago Industries they told me the belt above the doors had to be removed to gain access to the screws that hold the door hinges to the body. There's supposed to be a fastener at each of belt that needs to be removed then the belt will pop off. The fastener is under the trim belt at a 45* angle to the vertical surface. When it's unscrewed it will back into the painted surface of the fender. Upon inspection of the belt and fasteners it appears I can remove a few screws under the right front fender then raise the fender on it's hinges to gain access to the phillips head screw at the end of the belt. The fastener at the rear of the belt is also at a 45* angle to the painted surface. However this one is in front of a stationary panel that cannot be removed. It appears the end cap was screwed to the belt, then the belt was fastened in place. In any case it appears the belt has to be removed, but the method suggested doesn't appear to be the correct one. Is anyone familiar with the procedure as to how to remove this trim belt and gain access to the storage compartment hinges? I'd take your RV to the body shop and let them remove and reinstall the door. I've had a few off, both on my motorhome, and my Mom's. I can't recall if the end caps stayed on the belt molding or not. I think I took them off, but not sure if I had to. The basic process is correct, remove all the little screws and lift the belt molding off. Are you sure there's a stationary panel there? I would expect them all to hinge up. On mine there was a screw in the center of each hinge that released the belt molding. Then the regular hinge screws removed the door. There is a stationary panel as part of the step assembly. The trim belt I'm referring to is the one that extends from the front of the front fender panel to the entry door. It ends at the hinge side of the entry door. The last 3" to 4" over laps the permanent panel that houses the stairs. If you click on the picture you'll get a larger version where the trim belt is easier to see. Note the trim belt just above the cargo bay doors. I was told by Winnebago there is a single fastener at each end that needs to be removed. then the belt will pop off a series of retainers. I can see the screw that holds the end caps to the trim piece, but no other fasteners. tderone from your description is sounds like there may be several additional screws holding the trim in place. When I opened the front cargo bay door I did see a single screw in the panel above the door at about the center of the door. I thought it had something to do with the hinge, but it may be one of a series of additional screws holding the trim belt in place. I can't see any additional screws, but they may be hidden under some weather stripping. To further clarify things, were the trim pieces you removed held in place by screws, or were they snapped in place over a stationary retainer? As for having the body shop remove the door I would much rather do it myself. They don't have room to have the motorhome inside while making the repair. It will it will have to sit outside in the rain and snow. I don't want varmints to get in and certainly don't want things to be vandalized or stolen. It's currently in a weather tight garage where no damage can occur. The screws do indeed hold the belt line trim in place. Once the screws are out, it needs to be lifted up a little to get it free.